Sundays is the day of the week many people set aside to relax and unwind from the packed schedules that seem to rule our lives. But if you happen to find yourself in Buenos Aires on a Sunday, there will be no rest for the weary wanderer, there’s shopping to be done! 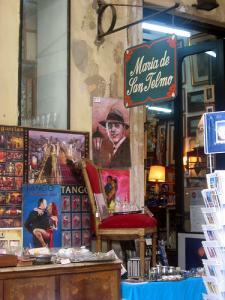 This day is the day of the Feria de San Telmo, a famous antique market in one of the city’s most celebrated barrios. The market takes over Plaza Dorrego and the length of Defensa street to Parque Lezama. The area morphs into a land of stalls with enough offerings to exhaust even the most dedicated shopper. Plan a day here to ogle the vintage clothing, hand-woven baskets, jewelry, and colored glass bottles and, of course, antiques. Don’t forget to take a look around the indoor market as well; this was the center of the old market. Entering from Defensa or Estados Unidos Streets there are more stalls with seemingly an endless supply of spoons, jewelry, lamps, and old glassware. There are stalls that specialize in one type of object, such as old-style telephones. In the morning, about half of the stalls in the indoor market sell fresh fruit, vegetables and meat. If it’s hot out, this is a good chance to get in the shade while still experiencing the market. If antiques don’t grab you, another reason not the miss the market is the entertainment along the shopping route. A carnival-like atmosphere reigns during the market, due to the crowds and the various street performers, who can be found every 15 meters or so or less. The street acts are interspersed through the length of Defensa, and include mimes, jugglers, bands and musicians of different stripes and impromptu tango shows. Some of them are quite impressive, such as the mime couple that are dressed and frozen as if in the world’s wildest windstorm, hair and tie frozen askew, in place. Make sure to take a minute to admire all the handmade jewelry and trinkets along Defensa that aren’t housed in official stalls. There are hidden treasures here and as with everyone peddling wares at the market, you are sure to be able to bargain a price to suit your budget. In addition to the market that comes and goes on Sunday, there are many great, permanent shops and restaurants in this area of San Telmo. If you aren’t tired of looking at antiques by the time you leave the plaza make sure to stop into some of the antique shops along Defensa. These antiquaries contain in their recesses more quality, and expensive, relics from the past. From magnificent chandeliers to marble statues and silver picture frames, stop in a few to get out of the bustle of the market and admire some really beautiful antiques. This page rendered in 0.319 seconds.